When the Runner encounters Tollbooth, he or she must pay 3credit, if able. If the Runner cannot pay 3credit, end the run. "Ever heard of a catch-22?" "Remind me to forget it." This is one of the most taxing ice in the game, combined with a hard end the run. That is rare enough that I would tell new players to start with this card when building corp decks of any faction. Yes, it's Femme Fatale target #1, but put another way, it clears a Fem off the table while probably still ending the run at least once. This costs Torch, the strongest code gate breaker in the game, 5 every time. It almost demands a Fem or Parasite + Datasuckers if the runner ever wants to see that server again. It is worth clicking for credits to pay for. This card is very, very good. This card, ladies and gentlemen. This card. My appreciation of the word 'toll' has gone up just by association it with this Code Gate. I suddenly feel like crossing bridges and reading Hemmingway. More of a barrier than most actual barriers, 5 strength worth of economic runner-wrangling, 2 influence, gold EVERYWHERE; I love it. I love it so much. 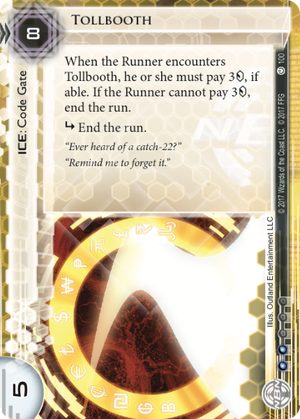 Whenever a runner hits this card I hear a resounding 'DONG', and imagine a shower of credits leaping from their pockets like Sonic the Hedgehog stubbing his toe on a robot crab. Even when I'm on the recieving end and all my carefully laid (premature) plans gets hit right in the coins, I feel like nodding and going 'well played, card, well played.' And I like to think it hears me. LIKE DIS IF THEY PAY EVRYTIEM =') - Its best feature isn't a subroutine, it resolves before everything else, and kicks the runner out if they can't cough up 3 bucks. Only once they've met this requirement can they even start breaking it. Everyone pays. (Wait, was Someone there? Hmm, must have been my imagination...) The point is this will present a very tall obstacle for the runner when they encounter it, and will add a recurring cost to the runners efforts from that point on. CHEWY: Usually a scary presence for ICE of all types, even Parasite will have a tough time eating this, and even if it manages it before a purge, the runner will have probably put most of their effort into achieving it. As for ways to play against Tollbooth: - As everyone says, keep a Femme Fatale handy, as she is a direct answer to this card, albeint at a pricey 9. If you can see (deduce) where an unrezzed one is, a timely Forged Activation Orders can force the corp to make a hard choice. If they trash it, they're down one of their best defenses. If they rez it, they just took an 8 hit that will likely limit them in other areas, such as servers with unrezzed ICE. (This is obvious to anyone familiar with the game, but...) Run early and often. Force the Corp to spend money on early game ICE here and there to keep you out, and don't let them build up too comfortable a reserve. If they do manage to hard rez a Tollbooth early then you're in trouble. Your economy might not be in place to deal with the recurring toll, and without the proper tools you're as good as locked out until you can find them. IF you know your opponent likes to get Tollbooths out early, consider swapping out a Yog.0 for a Gordian Blade. It will pay more to get through, a lot more, but it can do it alone. To sum up this card is one of the best pieces of ICE in the Core Set, and well worth including in almost every deck you make, even if you need to cut another piece of 'big' ICE from in-faction. *For more information look up some of the great retrospectives by people like Willingdone on Youtube. They're easy to follow I learned a lot from them! So, this is the most obnoxious piece of ICE in the game. What do you want your ICE to do? Like, generally, in the game of Netrunner, what's the plan? You want it to End The Run. Check. You want it to be bad for the runner if they run it without knowing what it is. Check. You want it to be difficult to get through every time afterwards. Check. You want it to be difficult to Parasite. Check. You want it to have a decent influence cost so you can use it in every deck. Check. So, just for example, this costs a Gordian Blade 3 to encounter, 3 to buff, and 1 to break. Cyber-Cypher is 3 to encounter, 1 to buff, 1 to break. Even a D4v1d is going to still cost you the 3 encounter fee. Faust is 3 and 3 cards. I could go on, but there are only 15 Decoders in the game right now, and in my opinion, at the time of this review, big code gates are the biggest issue for runners, but Anarchs especially. With Yog.0 and Parasite taking hits in the Most Wanted List, getting code gates down to a manageable cost is very difficult. So, how do you play around it? Well, easy answer is to make that large 8 rez cost a really difficult choice for the corp. It's not always easy with Breaker Bay Grid asset econ being the flavour of the month, a corp will gladly go down to zero knowing they can bounce back up to 2/3 credits before even their mandatory draw. Femme Fatale is the best answer, turning this card into a simply 1 tax, but this has its own issues with the card being 9 to install. (Femme in the bin, Stimhack + Clone Chip.) Sure they might remove the targetted Tollbooth, but even if they replace it with another one, you've made them spend 8 credits. The other answer is to run a few Spooned out of Anarch, and I think this is the way to go. Anarch's already have the worst problem with Code Gates. Lotus Field, is already enough of a headache for Yog.0 based rigs, enough to spend the influence on Atman for, and an Atman at 4 can break both Lotus and Tollbooth with Datasucker/Parasite support, but you've still got that egregious tax for encountering that is simply unsustainable, especially on a central. If you can't poke centrals consistently, the game moves to the remote, and thanks to BS like Ash 2X3ZB9CY and Caprice Nisei, contesting the remote is extremely difficult. And hey, even an Ash behind a Tollbooth is egregious on a remote as well. Making two runs in a turn against that nonsense is painful. Hunting Grounds is also a sort of answer, and does help against NBN especially with Data Raven, Pop-up Window and the like, but it's not foolproof by any stretch. You still have to actually break the Tollboth, but at 1 influence, it might be your preferred solution. So, all in all then, great card, maybe even the best ICE in the game, post-MWL. 1 of goes in pretty much every corp deck I build, and as a runner it's one of the cards I really hate to see rezzed. Prohibitive cost for both sides. One of Femme Fatale's most popular targets.